15 Marzo 2018 | in English. The Kurdish people always said it: we have no allies, except for the mountains. After having produced the erasure of ISIS from Syria’s map, the international community decided to abandon the Kurdish people to its fate. Neither Russia not the USA are lifting a finger against their ally, Erdogan: who have been trying for more than 50 days to reach Afrin, in Northern Syria, with the declared goal to carry out an ethnic cleansing of the area and install in power the Salafi gangs, allied with Turkey. The relentless resistance of the Syrian Democratic Forces continues, in spite of the disparity of forces, but the Turkish army is closing in on the few kilometers separating it from the Afrin city centre. While bombings on civilian infrastructure were multiplying, an urgent call to organize initiatives came - in order to break the silence of the West in front of what is concretely coming up as the umpteenth massacre on Syrian soil. Already last sunday in Turin almost 300 people gathered in Piazza Castello where a message from Jacopo was notified - being him a young Torinese reporter being in Afrin right now, as the only Italian civilian who is witnessing what is happening in the area. The Kurdish community and the Torinese supporters then marched till Porta Susa in spite of the pouring rain. On the following day, a symbolical occupation of the Mole Antonelliana wanted to further mark the solidarity of the Turinese with the Kurdish people, in one of the city landmarks. Overnight, instead, those who provide resources and equipment to attack the Northern Syria populace were reminded their responsibilities by unknowns. From information retrieved on the web, it looks like the writing “accomplices of the Afrin massacre” showed up on the officers of "Microtecnica SRL", a company that provides electronic components for the Kobra helicopters; while a warplane in front of the Leonardo-Finmeccanica Italian weapons’ factory was set on fire. On Monday new initiatives were held all over Italy. 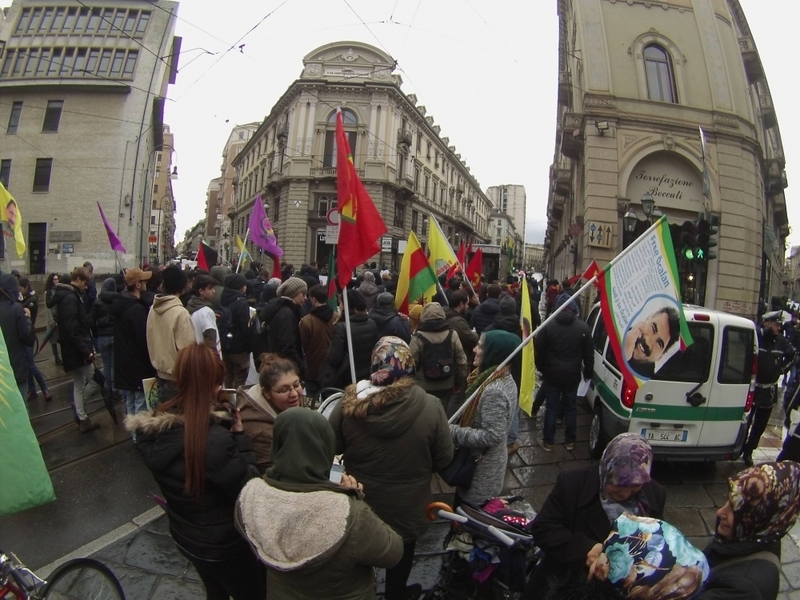 In Bologna there were about 400 people at the picket called up for Afrin. After meeting beneath the Neptune statue, the confederal revolution’s supporters then enlivened a march that crossed the city downtown and reached Piazza Verdi. Chants and slogans against the policies of Erdogan supported by the European Union, that turns a blind eye on Rojava while it massacres the migrants who flee imperialist violence in Syria. Before the event, the Collettivo Universitario Autonomo (Autonomous University Collective) strikes an office of the Unicredit bank, which is part of the financial institutions that cooperate and fund the Turkish state. In Milan there were banners in Piazza del duomo. In Rome a picket in Piazza Venezia reminded Italian responsibilities and our country’s complicity in the attack on the sole example of people’s self-determination in Syria. Many speeches reminded to passersby and tourists the hundreds of civilian victims that already perished in the attack, while the danger of a humanitarian disaster of massive scale is already announced, if nobody will speak against sultan Erdogan. There were solidarity actions in Florence, too. A banner was lowered from the Ponte Vecchio, with the Save Afrin writing, and a Turkish flag was burnt; while in the afternoon a picket took place beneath the local RAI (public television) headquarters, with the goal of breaking the silence that Italian media lowered on the Turkish attack on Afrin. In Pisa the Leaning Tower was stormed and symbolically occupied by the demonstrators. In Palermo, too, there was solidarity towards Afrin. Some students gathered in front of the Palermo university canteen with the banner “Erdogan murder”. From the megaphone there were words of solidarity and speeches to make the whole university community aware of what is happening in Northern Syria.